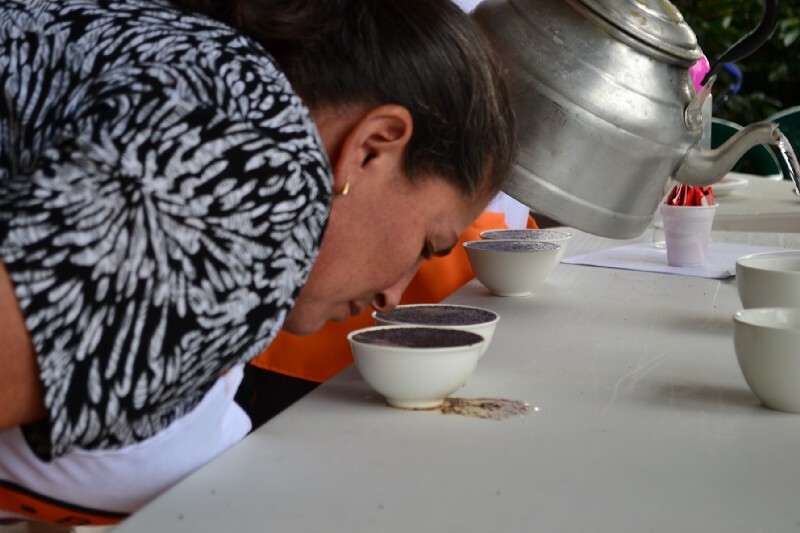 What do 16 women coffee producers have in common? 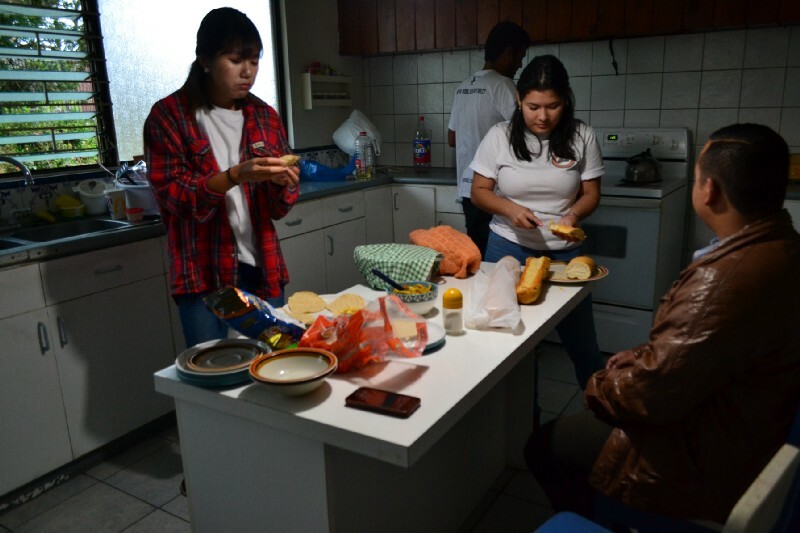 4:45 am — The team of facilitators from Bean Voyage gets ready for the big training program to be organized for 16 women coffee producers in Los Santos, Costa Rica. The night before, the entire team gathered at the apartment of its co-founders, put some finishing touches on the module, and played a ton of ice-breakers to get everyone in the organizing team acquainted. 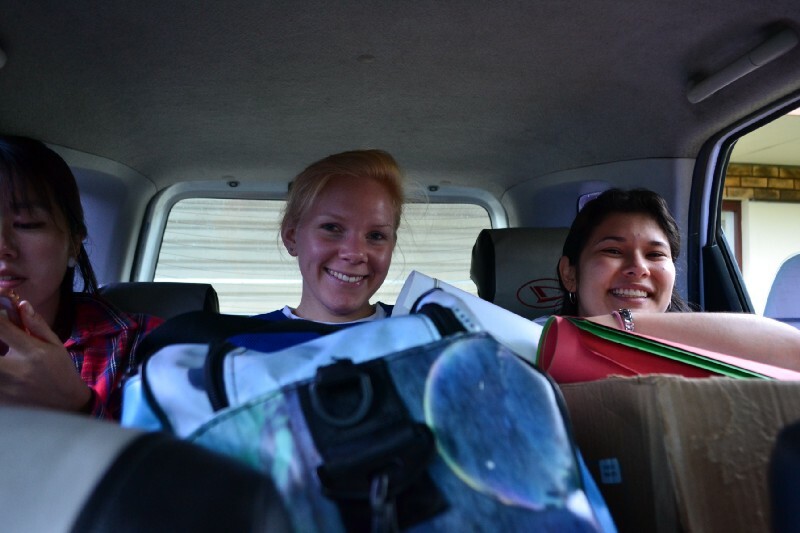 6:00 am — Tightly packed into a tiny jeep, the team heads out for a 1hr 14min drive to Los Santos. The training is being held at the processing center of our community partner, Centro Agricola Cantonal. 7:20 am — We’ve arrived! Half of the team starts preparing for the workshops while the rest drives to pick up some of the farmers who are not able to make it for the training themselves. 8:30 am — some of the participants arrive earlier than we had expected, and all of a sudden we are all ready to get started. As with all things in Costa Rica, the day starts off with some delicious coffee and cookies. 9:00 am — Nicol, who is one of our lead facilitators starts the day off with a warm up/ice breaker session. 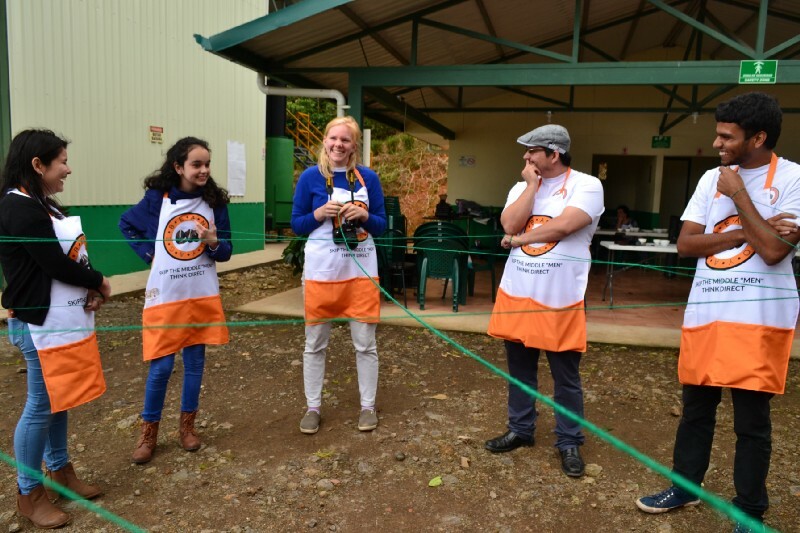 The two activities are focused around helping the participants feel more comfortable and learn each other’s names, as many of them had not met each other prior to the event. 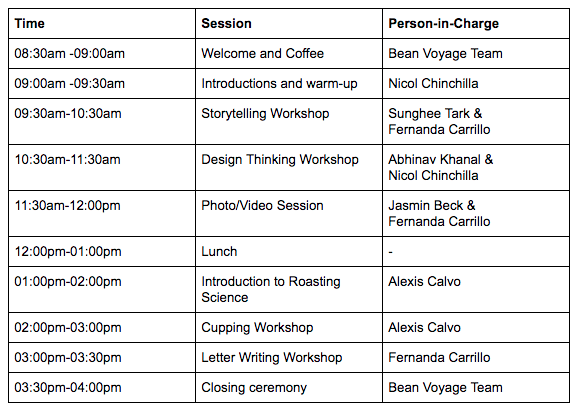 9:30 am — Sunghee and Fernanda start us off with a Storytelling workshop that is inspired by PIXAR and its format of effectively telling stories. 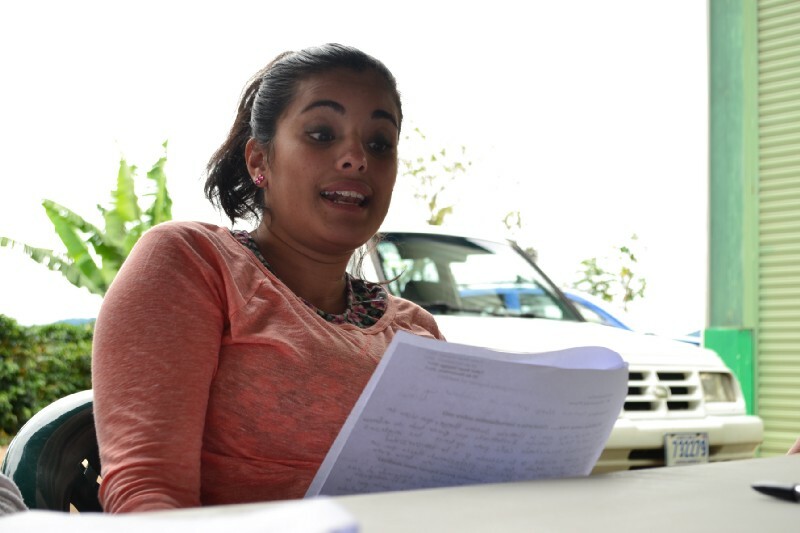 The aim of this workshop is to get our participants to recognize their own stories. Quite often, we learn the stories of others as leaders, champions, winners but we hardly focus on our own stories as one which is important. This hour is an opportunity for each of them (and us) to think back to our lives and discover a story that allows us to express our heroism in this world. At the end of the session, we ask any participants who want to share their stories. We had expected not many participants to share their stories, but as soon as we start this sharing session, almost all of the women share their stories and each of them has written beautifully of their stories, experiences, and aspirations for the future. We are still working on collecting these stories, but hope to share a few of them in the coming weeks on our facebook page! 10:30 am — After a quick game, we start with a design thinking workshop led by Nicol and Abhinav. 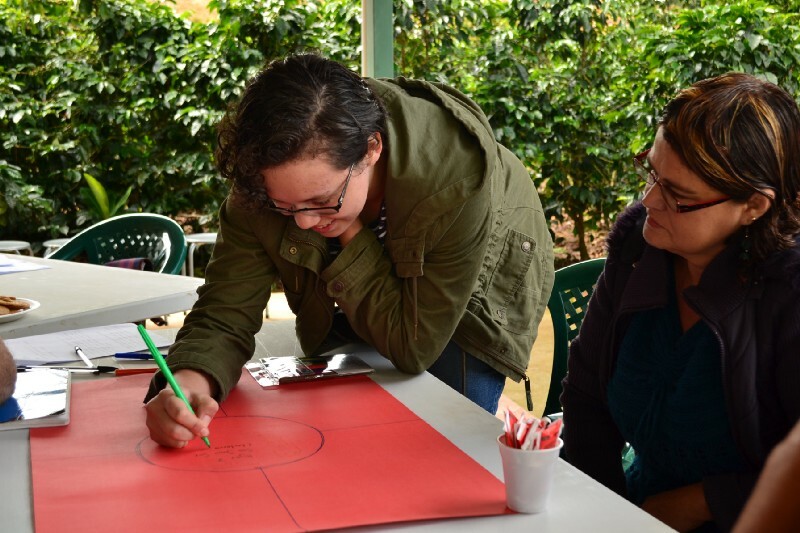 The workshop is called Pensamiento Conjunto (thinking together), and although it follows some of the principles of design thinking, it has been really adjusted to allow for the time constraint and the context of the workshop. 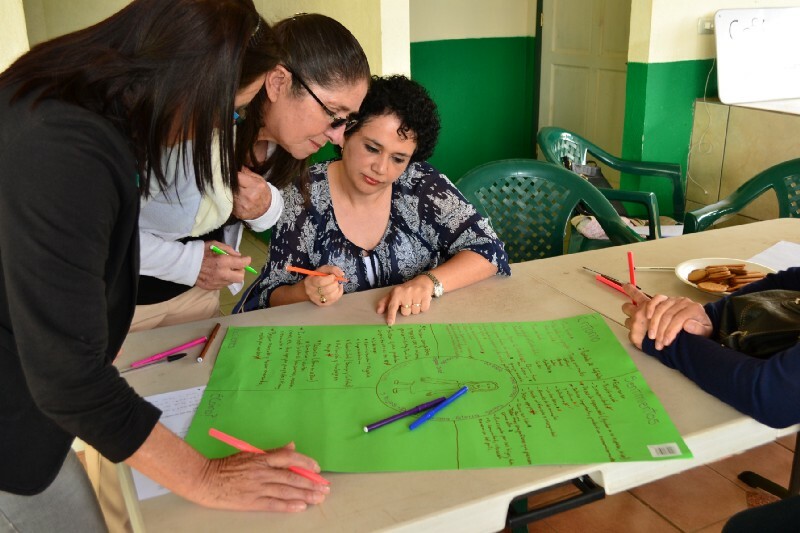 We ask the participants to start by creating an empathy map of a women coffee producer. Each of them, in their different group, create fictional characters and give their characters as many details as possible. Soon after, they are then asked to create four quadrants around the name, but unlike the traditional empathy map, we ask for the four quadrants to be named see, feel, actions, and how.The goal is for them to first empathize with their characters, and then focus on ideating and creating solutions that they believe would help this character with their challenges as a women coffee producer. Then the groups vote on their favorite ideas in a democratic form, and each group selects a specific idea that they then develop into a 3-minute presentation for the rest of the groups. The objective of this game is to get them to think about communal solutions to many of the challenges that they themselves feel, without the pressure of having to speak about their personal challenges in public. When isolating the character from any specific person, it allows for a more free-flowing discussion across the board. 12:15 pm — Lunch arrives a bit late, but when it finally arrives, we have everyone enjoying freshly prepared Casados con Chicaron by our local food manager, Vanessa. It was a treat for all as we enjoy the company of fellow coffee professionals from all phases of life. 01:00 pm — Amidst a lot of yawns thanks to the Casados, we are right on time to start the roasting workshop with Alexis Calvo, our SCA certified Q-Grader. Alexis divides the workshop into two parts — the science of roasting and practical session. In the first half, Alex speaks about the science of roasting by using terminologies that are easy to understand for a first time roaster. 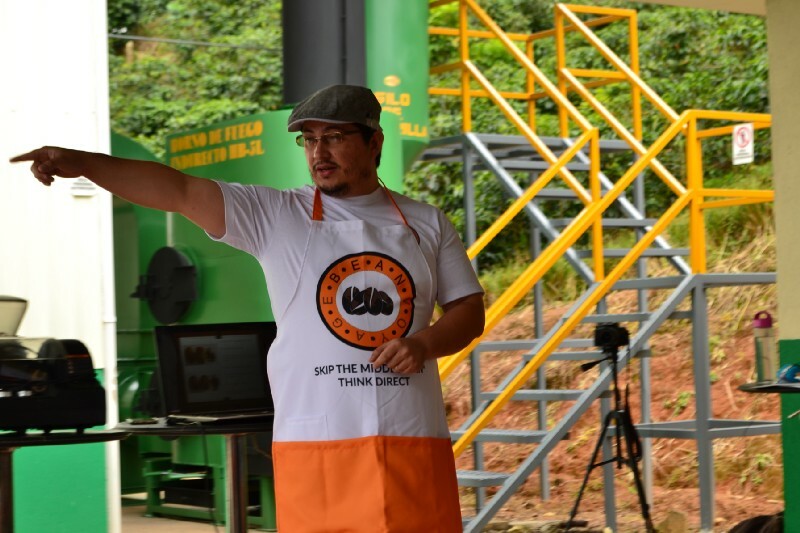 Except for a couple of women who have had roasted prior, 90% of our participants had never had experience in roasting coffee. Therefore, Alex had to be careful in using terms and examples that are easily understandable by a first time roaster. 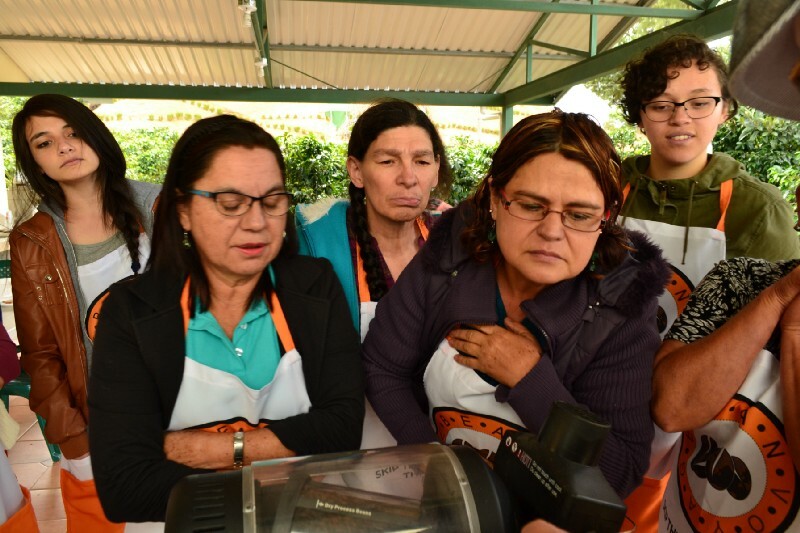 We were quite unsure of this session as we had never hosted such a large scale roasting course for women coffee producers previously — and we were worried that they would not find any of this science interesting. 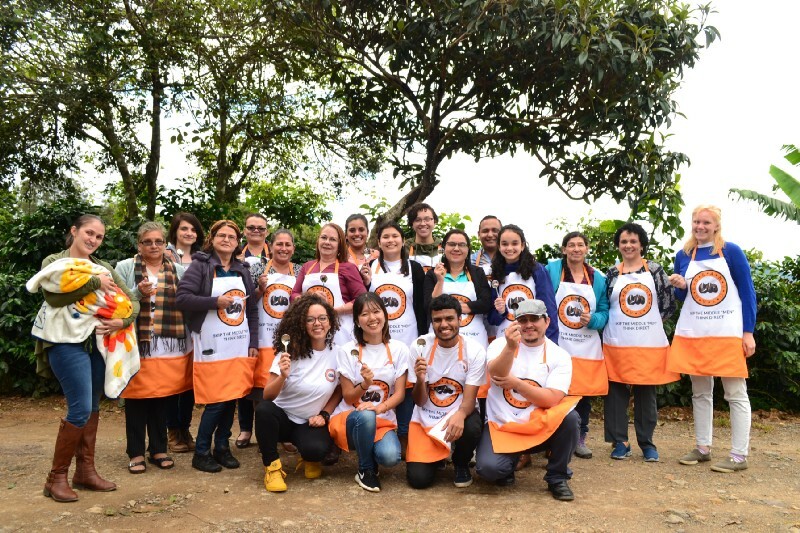 To our pleasant surprise, all of the women coffee producers have had a ton of questions for Alex, and started connecting to their few experiences of having roasted their coffee and/or to their experiences as life-long coffee producers. In the second part, Alex divides the participants into three groups and asks them to work with a small batch of coffee, identifying some defect beans to better understanding the quality of their coffee. Alex then allows each group to come up and use one of the micro-roasters to roast in groups. Due to time shortage, we couldn’t have all groups roast, but they roast it in one big group, and make a communal decision of the right time for the coffee to be ‘Cupping Ready’ (the type of roast perfect for cupping this coffee. Amidst a great deal of discussions, the group finally decided on a time — with some yelling ‘I can smell the burn!’ with laughters). 2:00 pm — After roasting a fresh batch of coffee, and amidst the excitement of having roasted for the first time, we move towards the most anticipated session of the day. Although some of our women producers have had some experiences in roasting coffee before, none of them had ever tried cupping coffee. Therefore, we move the chairs away, and set up a cupping station. As you can expect, this session is filled with chaos, excitement, mistakes, questions, and a lot of coffee and giggles. From smelling the coffee for fragrance and aroma to breaking the crust, it is a huge mess. But the kind of mess that shows us how much excitement there is among these producers to further learn about the process of cupping coffee. When it comes to the big moment — of tasting the coffee — some people are drinking the coffee and others are not sure of the quantity that they should drink. All in all, it was a session that filled our entire team with hope as it shows that such sessions would be of interest for the farmers in the future. 3:30 pm — Although we had planned a letter writing session for the farmers towards the end, due to time restrictions we were not able to head into the letter writing session as planned. 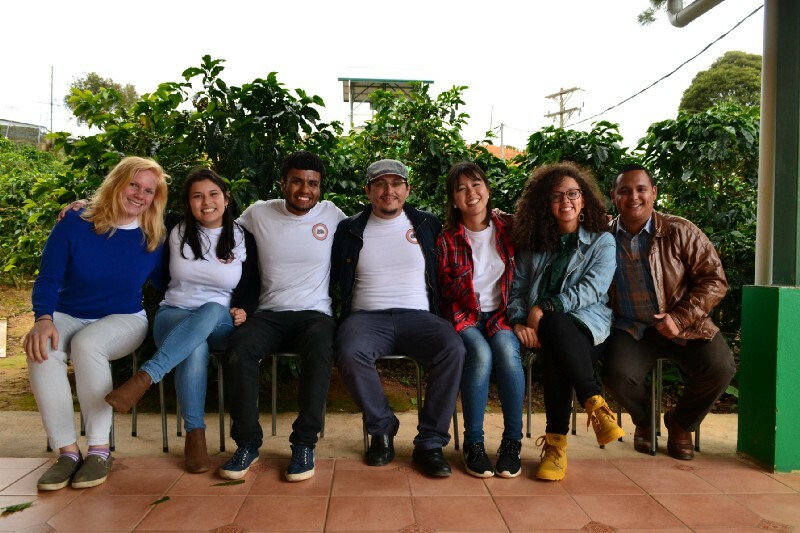 However, our entire team was happy to see them enjoy the cupping session and their enthusiasm to learn more about the process to better understand their quality of the coffee. 3:45 pm — As we wrap up, Nicol leads a reflection session where each participant holds a yarn and speaks of the one thing they have learned during the day and one thing they would like to learn in the coming year. Every single participant repeats how they would like to learn more about the roasting and cupping process. This was an exciting signal for us as we finalize our training module for the year 2018. 4:00 pm — What started as a group of strangers are now hugging each other, sharing contact information and providing us with well-needed feedback to better organize these sessions in the future. The best part of it was when one of the participants came up to Sunghee at the end and asked: “When’s the next training session — I want to attend each of these sessions”. This has been a touching moment for us as it showed the effectiveness of our work in these communities and the need for such work. Our team was highly flexible — even though we were not able to conduct a session as planned, we were able to observe the situation and deduce what was best for the participants on the spot. The energy among the participants was breathtaking! We, as an organization need to be more careful in drawing the line of when to take photos and videos in order to preserve the safe space for everyone. We’re looking forward to scaling our program to include 75 women coffee producers in 2018. Finally, we want to express our sincere gratitude to the Red Empress Foundation and Nancy Glassman for their support of our enrollment and training program this year. We are truly grateful for your support, and we look forward to working together in the coming year! Going back to the question of this reflection — what do the women coffee producers have in common? They now have greater agency to understand and evaluate the quality of their own coffee and negotiate for fairer prices from their buyers. If you’re inspired by our work, come support us by making your Christmas purchase from one of our women coffee producers here.